This time of year, our thoughts turn to things red and sweet. Yes, we're thinking about Valentine's Day. Some of us may even be thinking about President's Day, which falls on February 16 this year. It was George Washington about whom it is said that he, as a youngster, reduced a cherry tree to kindling. American children learn early about the cherry tree incident because of its sturdy little moral lesson. Little George was forthright about dispatching the tree, but I've always wondered what excuse, if any, followed the admission. We have included links to two pastry recipes, both excellent and never-fail, with one containing shortening and the other, butter. Either will result in a perfect pie crust. I can't choose between them. Oh, all right. I cannot tell a lie: I find the shortening crust, our Standard Pastry, to be a tiny bit lighter and flakier, but the butter crust is wonderfully flavorful and, if made in the food processer, quicker to put together. 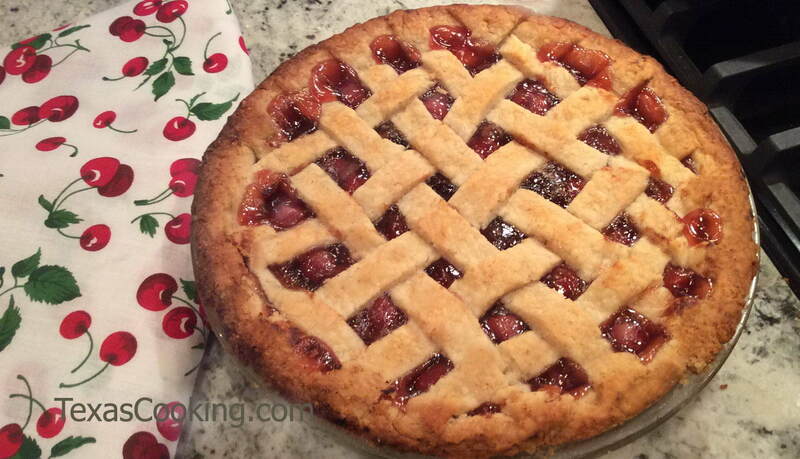 A lattice top is traditional on cherry pies, but not essential. If you choose not to make a lattice top, be sure to put several vents in your top crust. I encourage you to try a lattice top, though, if you've never made one before. They are fun to do and not at all difficult. A Cherry Pie, particularly if it is served warm and topped with a scoop of vanilla ice cream, has the power to inspire love. Luscious! Cherry pie is perfect with a scoop of vanilla ice cream, but taken "straight," it's still sublime. In saucepan, combine sugar, flour, cinnamon and undrained cherries. Cook over medium heat, stirring constantly until mixture thickens and boils (about 6 or 7 minutes). Remove from heat and stir in almond extract. Pour mixture into a 9-inch unbaked pie shell. Dot with butter. Cover with top crust, seal edges and crimp. If using a lattice crust, allow filling to cool before applying it. If a lattice crust is not used, put one or several vents in the crust. Bake at 425°F for 30 to 35 minutes until crust is golden brown.